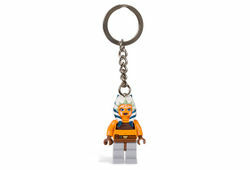 The set Ahsoka Key Chain was released in July 2008 as part of the The Clone Wars line. Included is one Ahsoka Tano minifigure who is obviously on a key chain. The set does not come with a lightsaber, and she cannot come apart, because of a special glue. Facts about "852353 Ahsoka Key Chain"